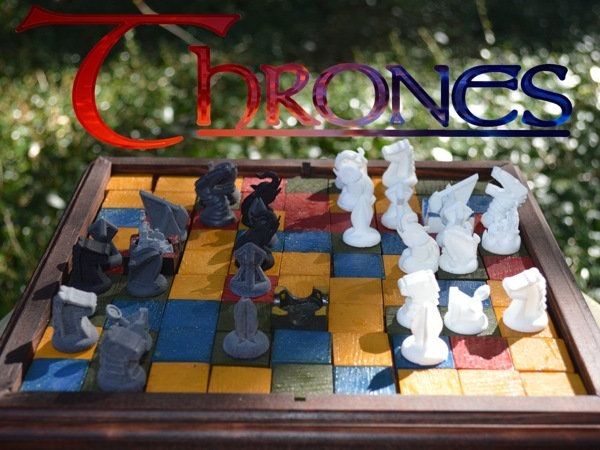 This is a BGE conversion of the "Thrones" boardgame, by Chad Anthony Randell, which was recently funded on [urlx=http://www.kickstarter.com/projects/1067223764/thrones-the-best-of-cyvasse-chess-and-stratego]Kickstarter[/urlx]. The digital conversion of this game is being released with permission from the game designer. Backers of the Kickstarter campaign who are curious to try out Thrones' gameplay before receiving their physical copy (est. June 2016) are welcome to try out this digital version. Thrones is a two-player strategy boardgame designed to reward creativity and improvisation, while never playing the same way twice. 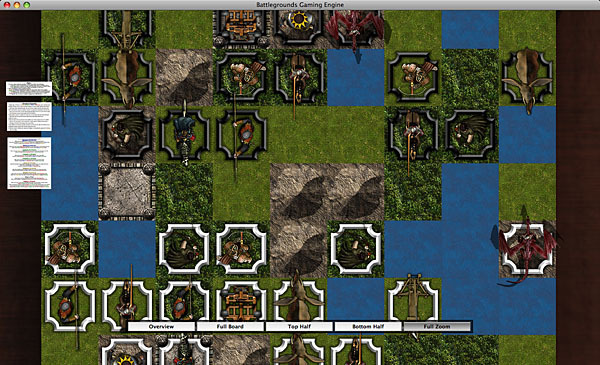 Players secretly place the terrain tiles which will comprise the gameboard (a 9x9 grid). 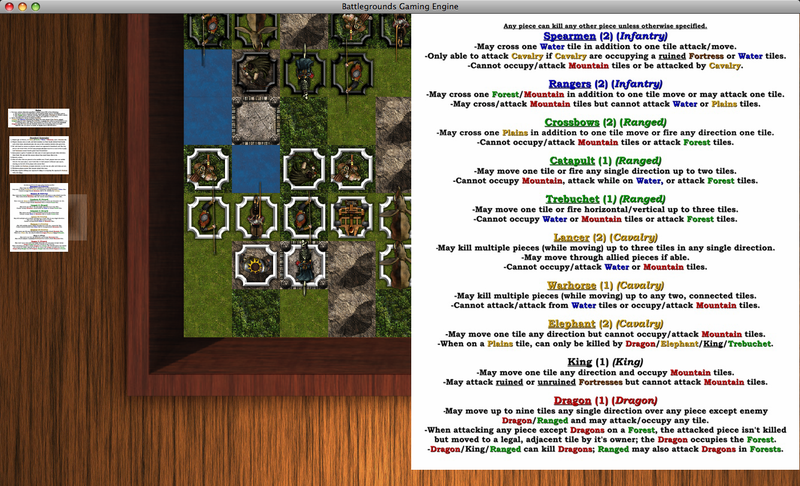 Players then secretly place their 15 units (a diverse mix, with both players having identical "armies", as in Chess). The terrain tiles will affect both combat and movement of these units. 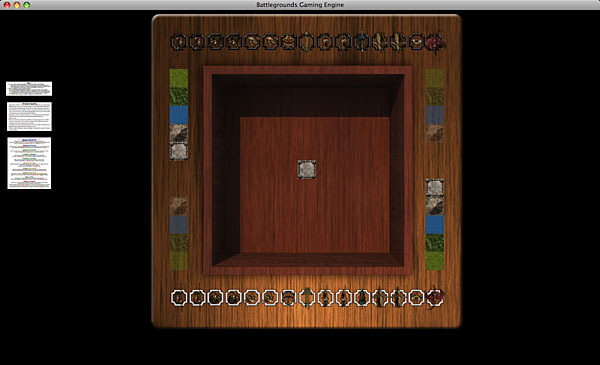 The object of the game is to kill their opponent's King; alternatively, a player may win by occupying his opponent's Fortress with his/her own King. The above download contains everything needed to play the game if you already have a BGE Gamer Client license (v1.5 or higher). BGE v1.7 or higher is recommended. Do NOT use BGE v1.6 with this release. Installation instructions are included in the download, and the game's rules are accessible directly during play from within the program. "Imagine a version of chess where each player can put their pieces anywhere on their half of the game board in secret, and you get some idea of what to expect from game designer Chad Anthony Randell’s Kickstarter game, Thrones. This highly strategic two-player game takes major inspiration from classic games like Chess, Cyvasse, and Stratego, to create a truly unique experience for two players." "Thrones is the embodiment of every quality I have been looking for in a two-player game. I absolutely love Thrones and I can say that any person would be lucky to have this in their game collection."